Sorry to expose my political leanings, but I rarely say that I love anything about a Bush. However, I thought Jenna looked so gorgeous at her wedding and I loved her hair. That picture is so sweet and simple. You can forget for a moment who she is and why her wedding pictures were in every major newspaper on Sunday. I am taking that first photo with me when I go in for my hair trial. 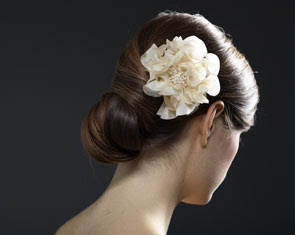 Its exactly what I have been looking for- loosely pulled back, with a flower and curls. Do you think that will work with my hair pin? Agreed. I have to say this was not at all what I was expecting... at all. I love the dress so much I would wear it, and I'm PARTICULAR about wedding dresses, I never like any of them... though I wish it were unembelished. Yep, we're so on the same page! I hate that family with a passion, yet the wedding was absolutely lovely and real. I'd wear her dress, too.